If you are looking for information on the American Male franchise business opportunity, American Male franchises or American Male franchising, then you have come to the right place. Be a part of the fastest growing segment of the salon industry... MEN. American Male salons are the total grooming experience! Men everywhere need haircuts, and American Male salons cater specifically to men's grooming needs. We offer haircuts, hand and foot detailing, facials, hair coloring or camouflaging the grey, and other services - all with a masculine touch. American Male salons are in a class by themselves - offering TV's, complimentary beverages and a place you can call your own with style and confidence. This unique salon experience is what brings men back time and time again. Own an American Male salon franchise and become a leader in this trend. American Male salons are on the move and will be coming to your neighborhood soon. We are on the look-out for organized professionals to become part of our salon franchise network. American Male is more than a barber shop. We are the men's total grooming experience providing upscale salon services that specifically cater to men and their grooming needs. 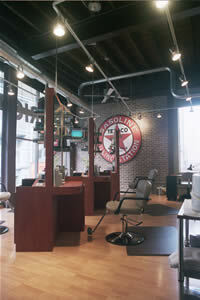 The salon experience has been completely reinvented at American Male. This isn't a girly-salon! American Male salons are in a class by themselves - offering TV's, complimentary beverages and a place you can call your own with style and confidence - all in a spacious, friendly and enjoyable atmosphere. Here's some of the exciting elements that make the American Male salon franchise system distinct. Our American Male Corporate Coaches work with you. We track your growth indicators monthly to help identify your strengths and weaknesses. Our coaches provide solutions to your challenges, and we can provide the benchmarks you'll need to make sure your salon franchise is right on track. We spend 10 days training you, the salon owner, at the American Male campus to teach you all you need to know about owning and operating an American Male salon. This includes hands-on training in an actual American Male salon. There isn't a better way to learn than by jumping in and doing it yourself. Then, prior to opening your salon, you will have three days of in-salon training at your location with an additional five days of training once your salon opens with an American Male Certified Corporate Trainer. Not only will we make your staff experts on the technical side of things so that they can perform all of the American Male salon services, but we will help them become experts in client dialogue, buying habits and client expectations. Over the years we have developed systems that work, and we make sure you understand how to make them work for you. American Male design experts design your salon layout. We have learned what makes men feel comfortable and pampered - yet we still keep in mind salon functionality. All your salon equipment is selected with men in mind and will be shipped and installed by our design team, making it easy for you. Our marketing materials and programs are second to none. Our clients are loyal and American Male salon marketing materials reflect their devotion to the total men's grooming experience. As a salon franchise owner, you will receive all your marketing materials to promote the grand opening of your American Male salon. Our marketing team also provides you with quarterly marketing campaigns that can be customized to fit your specific needs. American Male salons use the best in professional grooming products. Guys love our products and seek them out for their grooming needs. We have established relationships with our vendors to ensure special pricing and incentives for you, the salon franchise owner.